Summary: Hana knows how to frame a shot and tell a story; I look forward to her future efforts. Buddha Collapsed Out Of Shame is the second feature film from Hana Makhmalbaf, daughter of celebrated filmmaker Mohsen Makhmalbaf and sister of Samira. Some might cough nepotism – she attended Locarno at the age of eight with her short film The Day My Aunt Was Ill and became the youngest ever director to have a feature screened at Venice; at fourteen Joy of Madness was selected to play in Critics Week. Now, aged only nineteen, her film Buddha Collapsed Out Of Shame has won various awards including a Special Jury prize at the San Sebastian Film Festival. But is it any good? 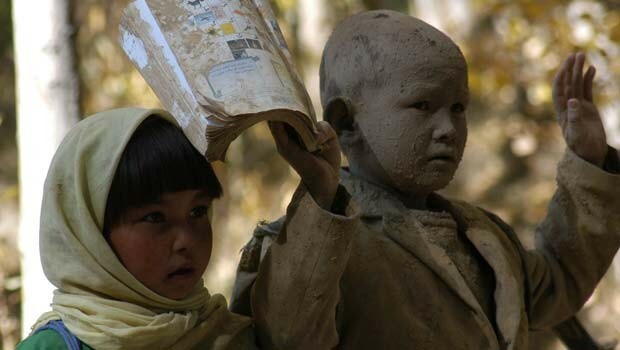 Set in Afghanistan, at its simplest level the film is the story of six-year-old Bakhtay (Noruz). Her neighbour, Abbas (Alijome), attends school and learns to read funny stories. Bakhtay is envious, and determines to go to school herself. She discovers that, in order to go to school, she needs a notebook and a pen, and determines to sell some eggs that will provide the money to purchase these items. And that’s actually, essentially, it in terms of plot outline. Set in Bamian, where the Taliban blew up the massive statures of the Buddha, the film explores the situation of Afghan women from a child’s perspective. It is successful on some levels and yet fails to add up to much. Despite the implication that women are left uneducated, we rapidly realise that there is a girls school. Bakhtay’s mother is out at work and if Bakhtay could only wait a day, she could easily ask her mother to take her to school. Other girls go, and the school is packed (the level of the teaching is another matter). What is more annoying is that Bakhtay is left in charge of her baby brother; when she heads off on her ‘epic’ journey she ties her brother up and basically abandons him. This is never followed up, and we never see her mother’s reaction. Nikbakht Noruz is very sweet, but Bakhtay’s persistence is along the lines of ‘are we there yet?’ repeated ad nauseam. She seems to have no appreciation that she cannot just wear people down by saying the same thing again and again and again. Minutes tick by with no dialogue apart from Bakhtay repeating variations of ‘buy my eggs’ and ‘let me go to school’ until you long to give her a clip round the ear and send her to the headmistress. The film gets more interesting, at least sociologically, when Bakhtay is captured by a group of boys pretending to be the Taliban, threatening to stone her for wearing lipstick. Yet even then, this seemed less significant than it was made out to be. Just read Rumer Godden’s ‘The Diddakoi’ to see that children are inherently, infinitely capable of cruelty. Still, Hana knows how to frame a shot and tell a story; I look forward to her future efforts.